Local governments are facing financial pressures that necessitate a steady stream of tax revenue. Yet, many homeowners have been negatively affected by the difficult economic times. This report looks at ways in which local governments can assist homeowners who justifiably have payment problems, without also increasing the cost of collection or limiting tax revenues. Most importantly, property tax collection procedures should encourage repayment rather than property loss, and they should not provide an opportunity for speculators to gain huge profits off homeowners in distress. All states have laws that permit local governments to sell property through a tax lien foreclosure process if the owner falls behind on property taxes or other municipal charges. A tax lien sale may be started over nonpayment of a tax bill of only a few hundred dollars. A $200,000 home may be sold at a tax lien sale for $1,200 and then quickly resold for a huge profit. Homeowners may lose not only a homestead but also hundreds of thousands of dollars in equity. This equity may represent their sole savings and security for retirement. 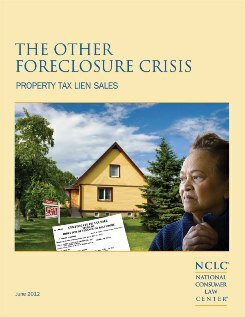 As a result, foreclosures related to tax lien sales may destabilize entire communities. $15 Billion and Counting: As homeowners navigate a difficult job market, declining home values, and high foreclosure rates, property tax delinquencies are increasing. Annual tax lien sales are now approximately $15 billion nationwide, according to the National Tax Lien Association. Outdated Laws: Very few states have enacted procedures to protect owners’ equity interests or to avoid windfalls to purchasers, and states rarely update tax lien laws to reflect current economic conditions or to ensure that proper safeguards exist to avoid unnecessary loss of homeownership. Elderly and Disabled Most at Risk: Homeowners most at risk are those who have fallen into default because they are incapable of managing their financial affairs, such as individuals suffering from Alzheimer’s, dementia, or other cognitive disorders. One government study also found that in 2011 property tax foreclosures in New York City were highly concentrated among low-income communities with large African American and Latino populations, groups also targeted by subprime lenders. Wall Street Reaps Huge Profits: Individual tax sale purchasers and some of the same companies (Bank of America and JPMorgan Chase) are ramping up lucrative profit centers. Why? Buying tax liens can yield an incredible rate of return, up to 50%. Many state laws also permit tax lien purchasers to charge homeowners extremely high interest rates and fees to redeem their property and avoid foreclosure. The following recommendations reflect the goals of preserving homeownership and ensuring prompt payment of local taxes. Make redemption costs affordable by keeping investor profits reasonable. State laws should be reformed to limit the maximum interest or penalty rate on redemption amounts to reflect current economic conditions. The interest rate should seek to discourage speculation and promote redemption. Place reasonable limitations on additional fees and costs. States should not permit investors to pad their profits by charging homeowners unreasonable fees to redeem after the foreclosure process has been initiated. State law should establish a maximum fee schedule based on reasonable, market rates for title searches, attorneys’ fees, and other fees. Establish a tax sale procedure, with court supervision. States should limit the initial tax sale to the sale of a tax lien certificate, rather than granting an entire interest in the property to a purchaser. If a homeowner fails to redeem the property, state law should require the purchaser to seek a court order authorizing final sale of the property. The court should confirm the final sale results and ensure that the sale price is fair and that any surplus funds are promptly paid to the homeowner. Implement redemption payment programs. Local tax offices should collect redemption payments to eliminate the possibility that an unscrupulous purchaser may thwart the owner’s attempt to redeem. The local tax office should accept partial and installment payments. Adequate notice should be given at every stage of the tax sale process. Notifications should be used as a tool to avoid loss of homeownership Comprehensive notices should use plain language; include information about tax exemptions, abatements, and repayment plans; and note the consequences of each stage of the tax sale process. Provide detailed notice of redemption rights. The notice should give all of the essential details on how the redemption right can be exercised, including the name and address to which the homeowner can remit payment; itemized costs; and the deadline for the redemption payment.